Introducing directly the face of rigpa in itself. Decide upon one thing, and one thing only. Confidence directly in the liberation of rising thoughts. Histories of the Dzogchen lineage tell how, as Garab Dorje attained nirvana, his body dissolved into space in the midst of a great cloud of rainbow light; the earth shuddered and miraculous sounds were heard. His disciple Mañjushrimitra, who had studied the Nyingtik teachings with him for seventy-five years, saw him in the sky, surrounded by light, and cried out “Alas, alas! O vast expanse! If the light that is our teacher is extinguished, who will there be to dispel the darkness of the world?“ It is said that, at this, Garab Dorje’s right hand and forearm appeared holding a golden casket, the size of a thumbnail, which circled round Mañjushrimitra three times, and descended into the palm of his hand. Inside it he found the Hitting the Essence in Three Words, Garab Dorje’s final testament, written in ink of liquid lapis lazuli on a leaf of five precious substances. Simply seeing it, Mañjushrimitra attained the same realization as his master. In fact, all four of the first vidyadharas of the Dzogchen lineage—Garab Dorje, Mañjushrimitra, Shri Singha and Jñanasutra—bequeathed a testament in a similar way to their disciples, whereupon the minds of the disciples and wisdom minds of the masters became inseparable. Hitting the Essence in Three Words has been revered by masters and practitioners throughout the centuries as embodying in its key points the very essence of the path of Dzogchen. Imagine you heard all eighty-four thousand teachings of Buddha and then contemplated on them. You would find that ultimately there was nothing that needed to be introduced beyond ‘Hitting the Essence in Three Words’. Compare these ‘three words’ to the teachings of a hundred panditas or a thousand siddhas, and there is nothing they can teach you beyond this. 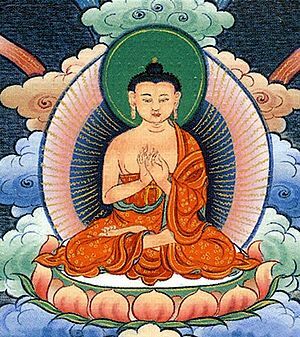 The omniscient Longchen Rabjam had realized completely the meaning of the three categories and nine spaces of Dzogpachenpo, and became inseparable from the Primordial Buddha Samantabhadra. Yet suppose you actually met him face to face: there would be nothing he could teach you beyond ‘Hitting the Essence in Three Words’. Rigdzin Jikmé Lingpa, Jikmé Gyalwé Nyugu and all the vidyadharas and masters of the three lineages—they could not possibly teach us anything beyond this one instruction. Patrul Rinpoche’s Special Teaching of the Wise and Glorious King, an elaboration, with its own commentary, on Hitting the Essence in Three Words, is treasured as the most crucial instruction for the practice of Dzogchen. Brief yet exceedingly profound, it captures the understanding of the trekchö practice, and is “the infallible key point of the path of primordial purity in the natural Dzogpachenpo”. Sogyal Rinpoche, US retreat held at Vajrapani Institute in the Santa Cruz mountains, spring 1984. ↑ Though Hitting the Essence in Three Words is one popular translation of the title, the ‘words’ in question are more a case of ‘statements’, ‘verses’or ‘lines’. Chökyi Nyima Rinpoche. 'Three Words' in Quintessential Dzogchen, translated & compiled by Erik Pema Kunsang and Marcia Binder Schmidt (Boudhanath, Hong Kong & Esby: Rangjung Yeshe Publications, 2006), pages 185-189. His Holiness the Dalai Lama. Dzogchen: The Heart Essence of the Great Perfection (Ithaca: Snow Lion, 2004), Part Two 'Hitting the Essence in Three Words', which contains the complete translation of Patrul's commentary, The Special Teaching of the Wise and Glorious King. Lingpa, Orgyen Kusum. A Treasury of Sublime Instructions on the Perception of Primordial Wisdom, translated by Sangye Khandro (Los Angeles: Jewel Island Press, 2000), the second part, pages 94-143. This page was last edited on 9 April 2018, at 08:28.